The law college you choose would decide your prospects, where you get gainful employment, and therefore exercising the judgment about a law college is a very important decision to make before CLAT counseling or counseling of other law entrance exams which you have appeared for. There are two kinds of law courses in India at the moment. One of them is a 3 year LLB course, and another is the 5 year law course. In the 3 year LLB one studies around 50 subjects, and in 5 year LLB one studies 80 subjects. The 3 year LLB course is open for those who are already graduates, and 5 year LLB course is for students who just cleared their grade XII exam. The best colleges for 3 year LLB course are Delhi University colleges Campus Law Center, Law Center 1, and Law Center II, Government law college Mumbai, Banaras Hindu University law college, Colleges covered under the ambit of Kerela Common entrance test, Bhartiya Vidyapeeth college, and colleges affiliated to the Punjab University LLB exam. 1) Location- Usually the placement companies which come to college are from the same vicinity where you college is so deciding the college is in a way deciding where you want to work later in life. Choose wisely, and either go to your hometown or a metro city. Metros because that is where all the good jobs are. 2) Specialization- Law is vast, and you study 80 subjects, but you can only choose one area of expertise whether you are litigating or doing corporate. If you know which area interests you the most then do find a college which offers a master, or a diploma in that stream. 3) Facilities on campus- A good law school worth its salt would offer you a great library for research work, student's body which conducts debates, moots, and extracurricular activities, avenues to stay fit such as a gym, and yoga class, sports ground, and good hostels with a good mess, and food court. Plus, good neighborhood with all facilities nearby. Some law schools are pretty far out in city's exteriors so see if that suits you and you can spend 3 or 5 long years there. 4) Placements- Most importantly check with the alumni for how the placements are. A good course is only justified when one gets a decent paying job at the end of it. Law is for hard workers, and tougher than one would perceive. Be prepared to dedicate 16 hours or so every day with probably no weekends at all. It is taxing but my point is it is very well paying. You should know that law firms are paying as much as 15 lakh p.a. to deserving fresher students and on an average one can get 6 lakh p.a. A functional placement cell in the college is of high importance. 5) Fee is another major aspect. Government law colleges charge half of what some private colleges do. So, do not be disheartened by a shocking fee figure of one or two elite colleges as there will be many good colleges charging much lesser. 6) Curriculum is important. Read the brochure well because it serves an important purpose. Some colleges have percentage system, and some others have CGPA. Some have moots, and internships as compulsory and others do not. Some colleges have an impressive line-up of extracurriculars and the choice could be tough. The colleges with compulsory research papers, and more activities provide better overall growth. This aspect should be properly looked into before picking a college. 7) Bar exam- It is a hidden and very important facet. Colleges with better rate of students who clear the bar exam are better. Colleges where students often fail this exam are clearly losing out. Why this is the case is because no one who has not cleared the bar exam can appear in the courts thereby making this an important nugget of information. 8) The strength of the class matters. A good college would not pile up students with a poor faculty : student ratio. 9) Diversity in the crowd- Colleges which are more cosmopolitan are definitely better than a college with a lot of geography based reservation. 10) Talk to alumni - Talk to alumni of every Law school. Discuss their opinion about the particular college. Ask about their experiences on campus, with faculty and the specific programme you’re considering. Also, question them about academics and social aspects such as life off-campus, and networking with other students. 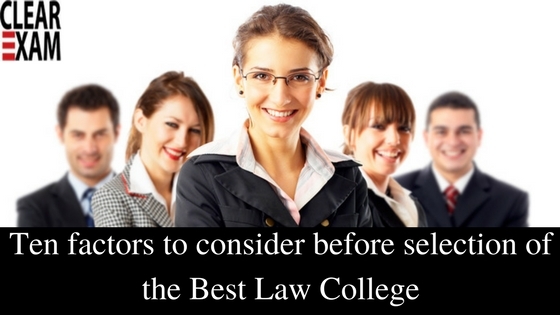 These are pretty much the things which you should look at for choosing a law college wisely. Good luck!